The youngest of the four major record companies and the first West Coast label of note. Capitol was started in 1942 by Johnny Mercer, the songwriter behind such classics as “You Must Have Been A Beautiful Baby”, “Fools Rush In” and “One For My Baby (And One More For The Road)”, who gave the fledging company instant musical credibility. His co-founders were well-chosen for what they brought to the table to compliment Mercer’s artistic abilities, with music store owner Glenn Wallichs who knew how to sell the product, and movie producer Buddy DeSylva who had the money and connections needed to thrive. With the three existing major labels (RCA, Decca and Columbia) all located in New York, Capitol had an open field out west and took advantage of the growing population in California and America’s ongoing westward expansion as whole, as well as enjoying access to Hollywood where DeSylva of course was powerbroker in film and Mercer had already received multiple Academy Award nominations as a songwriter. The label however had the misfortune of starting just before the first Petrillo recording ban was about to start. With so few sessions having been cut they were potentially much more affected by it than established companies who had a backlog of recordings to draw from as operations shut down. But Capitol hit the ground running when Ella Mae Morse hit #1 with “Cow Cow Boogie”, one of their first releases which gave the upstart company instant cachet. As the ban went on and crippled the record industry Capitol saw the writing on the wall before anyone else and became the first company to settle with the union in 1943, thereby giving them the ability to cut new material long before the giants Columbia and RCA who stubbornly held out for another year. In that time Capitol’s position rapidly improved with this influx of newly recorded material and with Mercer’s solid reputation when it came to providing artists the means with which to create freely, the company was firmly ensconced as fourth major by 1946. Like the other major labels their success in pop meant they didn’t need to focus on the marginal niche styles as the less well-funded independent companies that began around the same time were doing to surivive. As a result they only dabbled in music from across the tracks, intially with their Capitol Americana imprint (titles from which we’ll include here under the main designation). Most of the early rock artists they employed early on such as Crown Prince Waterford had prior records in more established fields and thus they viewed them more as hybrid acts in terms of how they could be marketed. Thus from the dawn of rock in 1947 through the end of the 1950’s when they were at their peak as a pure pop label they had only passing interest in rock with just a handful of acts such as The Five Keys and Gene Vincent giving them any real presence on the rock scene. But by the early 1960’s their rock fortunes changed quickly thanks to two of the biggest selling and most revolutionary groups of all-time which put them at the forefront of rock amongst the major labels going forward. The first act to make a big impact were a local L.A. group named The Beach Boys who quickly moved beyond the perceived gimmickry of surf-rock to become the most highly acclaimed American rock band ever. Two years after signing them they somewhat reluctantly agreed to distribute The Beatles records in America, as was their right thanks to an already established deal with EMI, and of course The Fab Four became the biggest act in all of music, not just rock. With those two groups on board the label soon saw fit to expand their rock presence further. While never investing heavily in the genre in terms of the percentage of their overall output, Capitol nevertheless had great success with the handful of rock acts it did have under contract over the years which included The Band, Lou Rawls, Steve Miller, Bob Seger, Tavares, Maze featuring Frankie Beverly, Paul McCartney & Wings, Tina Turner, George Clinton, Beastie Boys, Foo Fighters, Radiohead and Katy Perry, though with comparatively little creative contributions to any of these artists work. 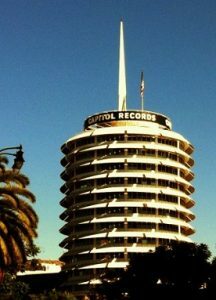 With their record stack designed Capitol Tower building becoming an iconic L.A. landmark, their distinctive orange and yellow swirl labels adorning the records of some of the biggest hits of the 60’s thanks to their two signature groups of that era, Capitol’s success with rock ‘n’ roll, though fortuitous in nature, outdistanced the other major labels they were competing against for supremacy in the music world, even though for the most part they too were vastly outworked in that field by a number of hustling smaller indie labels who made rock their overwhelming focus. Capitol’s loftier aims for much of their history ultimately succeeded in making them a major label yet prevented them from becoming a major player in rock ‘n’ roll until which time they had no choice.